Blue Ribbon - Always the Best. 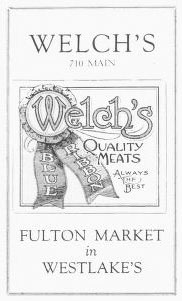 Fulton Market in Westlake's. The eminent chefs of the High Schools here, are familiar with meats, for the kiddies they cheer. Take Lewis and Clark and North Central too, and Havermale Junior, they also come through. 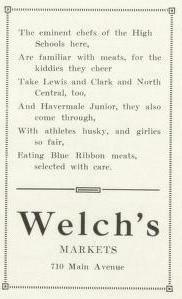 With athletes husky and girlies so fair, eating Blue Ribbon meats, selected with care.